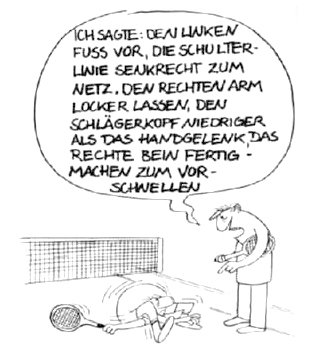 Beim Inner Coaching gehen wir davon aus, daß Tennisspieler_innen die Fähigkeiten haben, einen eigenen Weg zu einem erfolgreichen Tennisspiel zu finden. Viele Trainervorgaben, Anleitungen und Anweisungen, Richtig/Falsch-Befehle, stehen aus unserer Ansicht einer individuellen, intuitiven Entwicklung im Wege und “stören” sowohl die „Performance“ der Könner als auch der Lernenden. Aus den aktuellen Erkenntnissen der Sportpsychologie, der Neurowissenschaften und dem Bewegungslernen entwickeln wir sogenannte „Trick the mind“ – Strategien, mit denen wir die Aufmerksamkeit auf das Wesentliche lenken. So ermöglichen wir dem Körper und vor allem unserem Gehirn, intuitiv die beste Lösung für die Bewegungsaufgabe zu finden. Inner Coaching Training ist ein fester Bestandteil unseres Trainings. Auch bieten wir Vorträge und Workshops dazu an. Inner Coaching* describes our teaching and learning philosophy. We believe, that players have the skills to find their own way to be successful in their sport. We are tenniscoaches, so our experiences come from our sport, but we always try to think “outside the box”. Many coaches still use binding specifications, manuals and instructions or true/false commands in coaching the beginner and the pro! From our view, this is disturbing for an individual, intuitive development and performance. We have it given up! We nearly don’t need it anymore! From the current knowledge of sports psychology, neuroscience and motor learning, we believe in the „self-organization“ of (motor-)learning. In following the inner coaching principles, we are developing so-called “trick the mind”-strategies. They help the coach and the client to draw attention to the essentials. This allows the client’s body and especially his brain to intuitively find the best solution for the motion task. Inner Coaching is an integral part of our training in our tennisschool „TMS-die mobile Tennisschule“ (http://www.tms-tennis.de). We also offer lectures for coaches and Inner Coaching Workshops at regular intervals. 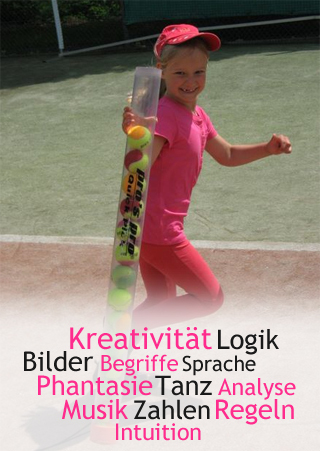 On http://www.innercoaching-blog.de you find more about motor learning, drills for your tennis lessons, about mentaltraining for athlets and more. Some articles are only written in german. If you need a translation, tell us! *Inner Coaching is known since Timothy Gallwey developed his ideas of the „Inner Game“. Gallweys method is still relevant and many coaches in sports or in organization development use them.